Dot’s hips are OFA “good”. Her last eye exam in May of 2005 was clear. After four litters, Dot has retired from breeding and is now concentrating on earning her titles and ruling the house with an iron paw. 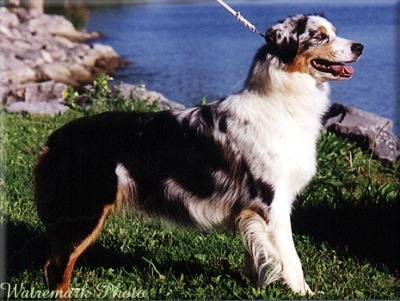 The second with ASCA/AM Ch. Hearthside Kodak Moment. The third with ASCA/AKC CH Beauwood’s Sierra-Echo Yogiber STDscd, RJ-E, JJ-E, GS-O, AX, AXJ, EAC EJC OGC JHD DNA-CP. The fourth with ASCA/AM Ch. Arboretums Ilex Montana HOF. Dot earned her CGC in April of 2007.